South Dakota Governor Dennis Daugaard has proposed a budget that includes annual motor fuel tax increases, joining a number of recent states that have increased or indexed their gas taxes. Gas taxes align with the benefit principle of taxation: by and large, consumers pay for road maintenance to the degree to which they use roads, directly or indirectly. While motorists incur the bulk of this tax burden, they do not do so exclusively: for instance, a person who doesn’t have a car, but purchases goods shipped along the nation’s roadways, contributes to the extent that the tax burden is exported to consumers. In South Dakota, the rate is 24 cents per gallon (cpg), counting both the 22 cent gasoline excise and the 2 cent tank inspection fee. 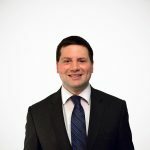 The revenues from this gas tax, like other gas taxes, have eroded over time due to inflation, a process exacerbated by otherwise positive developments like increased fuel economy and an increasing shift to hybrid or electric vehicles. Daugaard’s plan would raise the gas tax by 2 cents per gallon each year. By choosing an increase in nominal cents, rather than a percentage-based or inflation-linked adjustment, the Governor has chosen a mechanism that will allow the tax to increase rapidly at first, with the impact leveling off over time. The first year’s increase would be 8 percent. By year twenty, the tax would stand at 64 cents cpg, but the annual percentage increase would have declined to about 3 percent. Eventually, it would increase at a rate below the rate of inflation, though not before effecting a substantial increase in the rate. 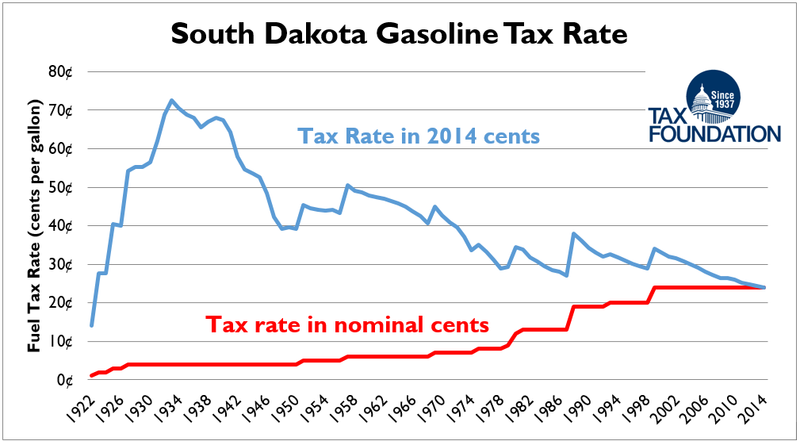 Imagine, as a thought experiment, that South Dakota had adopted this growth provision back in 1988, when the gas tax increased from 13 to 19 cpg. The excise would have reached 73 cpg this year, matching its 1933 peak and beating Pennsylvania’s 50.5 cpg to be the highest fuel tax in the nation. States are trying different types of gasoline tax changes recently. A number of states have turned to an ad valorem model, adjusting some portion of their gasoline tax for the wholesale price of gasoline. Several others adjust their motor fuel tax for inflation; Massachusetts was expected to join their ranks, but voters swatted down the measure last November. Nebraska adjusts the levy based on the state’s transportation needs. Other states, unfortunately, are increasingly relying on general fund revenue to pay for transportation infrastructure. If Daugaard’s proposal were to be adopted, South Dakota would be the only state raising its gasoline tax each year by a flat amount. Legislators could concur with this new approach, counter with a one-time or phased-in increase, seek to shift away from the traditional excise model, or insist on the current rates. But as the debate commences, policymakers should endeavor to retain the attractive qualities of a motor fuel tax while exploring any options to address revenue stability concerns.